At Hood Park Leisure Centre we have two superb, state of the art, 3G hybrid pitches. The surface offers players an even and consistent playing pitch to enjoy their games on. We also have equally state of the art, white light system. 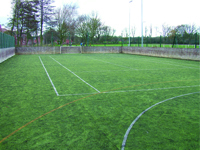 Space is available on these pitches throughout the week. Why not book online now or call 01530 412181! Alternatively, if you have a few friends who want to play regularly as a 5-a-side team, why not have a look at our football leagues at Hood Park Leisure Centre!